Synchronized diving, track, the high beam—even beach volleyball—I must admit I’m mesmerized. Usually, I can barely turn on our state-of-the-art TV, but to watch the Olympic Games and the fabulous nonstop travel tours of China, I’ve managed to master the multiple remote controls and record-for-later features. Since I’m the sort of person who easily succumbs to the power of suggestion, I’ve been serving veggie stir fry more often than usual. 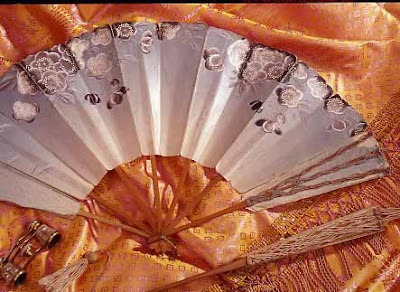 I’ve also been fantasizing about decorating with fans, pagodas, paper lanterns and Chinoiserie. 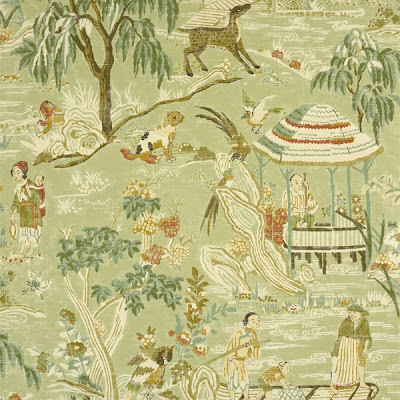 The word Chinoiserie was coined in the late 17th century to describe the Western world’s fascination with the architecture, art, fashion, and interior design of the Orient. 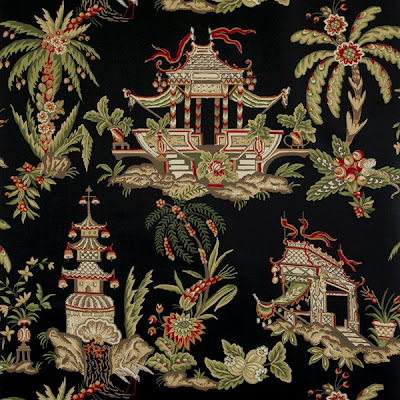 By the 1800s, fashionable European homes and grand estates boasted a “Chinese room” decorated with Asian style furniture and artifacts with a decidedly Asian appearance. As a suitable backdrop, the room’s walls were frequently covered with floral designs painted on hand-loomed silk or hand-painted Chinese panoramas made from tiny pieces of handmade paper pasted together to form long panels. Today, the de Gournay company recreates the 18th-century method as faithfully as possible, with small pieces of paper affixed to four-by-ten-foot panels. Artists then distress the panels to replicate the look of sundried paper before painting the designs. Then, as now, these papers are cost a king’s ransom. 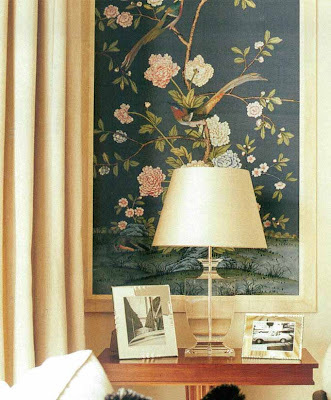 But thanks to technological advances in rotary printing and eco-friendly inks (with the look of layered, hand-applied pigment), several American wallpaper manufacturers now offer Chinoiserie’s romantic floral and exotic fauna patterns at prices even the masses can afford. 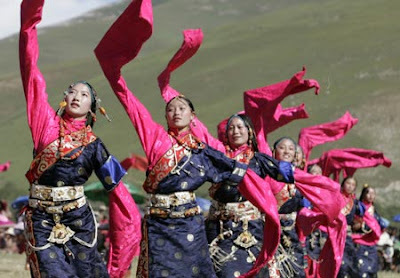 And while you're watching those fabulous views of the Great Wall, remember that although these Tibetan artists may dance, they yearn to be FREE. Since meeting at the Interior Design school, Emily and Lauren have turned their similar tastes in decor and their intense passion for fabric into a sassy blog. Visit the Material Girls for an irreverent take on the world of decorating and fashion. 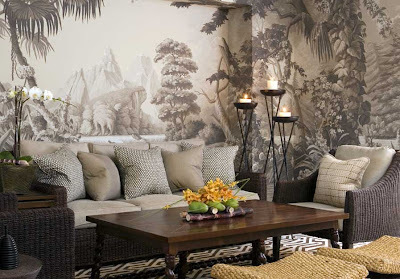 Really beautiful artwork and wall papers. Love your blog. Going to go look at the Material Girls! Fabulous wall papers... love the artistry and the painstaking process that goes into their designs..
Love your pics... As always full of COLOR!! Totally FANTABULOUS!! Being from the San Francisco Bay Area, our lives are surrounded by these accents in our interiors, exteriors, and gardens. I love it!!!! I feel very fortunate to get to have this as part of my life. And the chinoserie? Well, that's a given around here. My brother knows a lady who is on target to get a gold...so we are really watching the events closely! The de Gourney L’Eden is just sublime! And so are paper lanterns! Great Post! 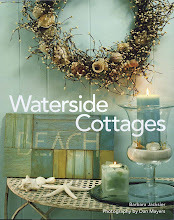 I love the wallpaper from Thibaut. I've been thinking about decorating my powder room with an Asian influence since watching the Olympics. I've referenced your name and blog in my blog - Simply Chic - as a good place to visit. I'll be back again soon. 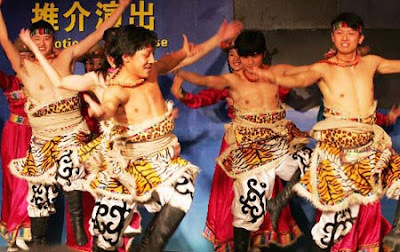 What a wonderful and creative way to celebrate China and the Olympic games Barbara...I am really enjoying them too. Love to you and wishing you a warm and sunny week! I would much rather look at your beautiful silk painting and hanging that watch the Olympics. Cannot stand spectator sport. Oh! And the stir fry sounds wonderful, can I come for dinner? Hi Barbara, I love your post and all the beautiful designs. We are really into the Olympics here and even kept up on vacation. Thank you for your visit to my anniversary post and giveaway. I was blessed by your thoughtful and kind words. See you again soon. I've been craving stir fry too, and just had to go and pick some up last night! Mine definately has a Midwestern flair (or lack of flair?) when I make it myself. Great post - I have been thankful for the rain we have had ...which lessened my evening chores ..hence giving me more time to tune into the Olympics! Amazing athletes and scenery. 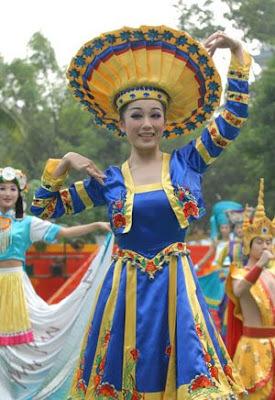 I bust out laughing when they showed some of the food delicacies! I recently started blogging and your blog is just so wonderful that I have added it to my favorites. It's beautiful! Please stop by any time! Of course, my blog can't compare to yours but I would love any suggestions! Thanks! I've only caught a bit of the Olympics here and there. Nice photos. 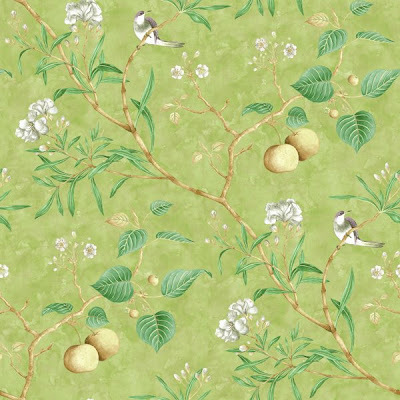 Love the Chinoiserie... very pretty! Are you totally addicted to the Olympics and lacking sleep like most of America... lol! My painting of the Getty from your photo is coming along very nicely! Will show it SOON! 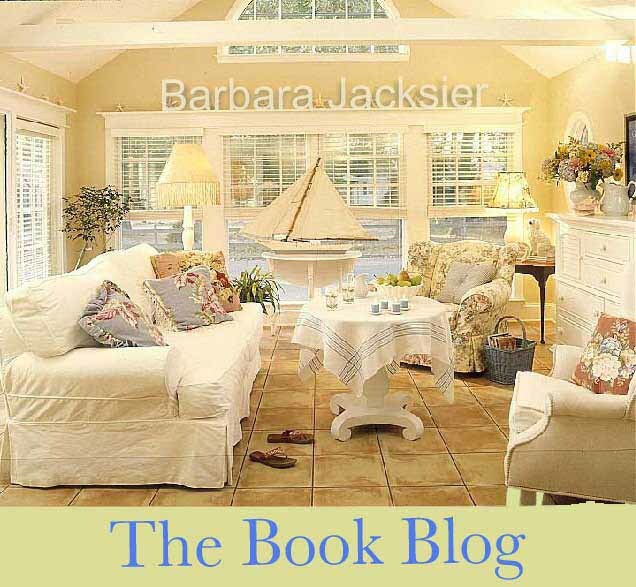 Hi Barbara, I just read your comment on my blog about Blogger being nuts! I guess you straightened it out but wanted to lend support if you still need it. In the meantime, thanks for this stunning post!!! I love the lamps in your pics. I think a piece of furniture of the Chinese influence looks great in any style home.